The phone rang a few days ago and it was the folks from Federal Cartridge. Now, it isn't very often that a single shotgun shell is so good that it compels me to buy a complete shotgun to best take advantage of it. In fact, it has never happened before in my life so I'll call that not very often. That shell is the Federal Heavyweight #7 20 Gauge 1-1/2 oz. shell, part number PHT258F. Directly put, it allows the 20 gauge three inch chambered shotguns to do what they have never been able to do before. It isn't like I've tried to keep it a secret all to myself, not at all. You can review http://randywakeman.com/TalkingTurkeyAboutPelletPenetration.htm , http://randywakeman.com/Federal20GaugeTurkeyLoad.htm , and http://randywakeman.com/FederalHeavyweight12GaugeTurkey.htm for starters. Wounding ballistics has been largely overlooked in a comprehensive sense, so I've tried to fill the gap on that topic a bit at http://http.randywakeman.com/WoundingBallisticsfortheWingshooter.htm. A one and a half ounce payload out of a twenty gauge is a heavyweight payload anyway, to be sure. Many folks have written to ask if this wouldn't be the ultimate 20 gauge long-range duck or extreme 20 gauge pheasant load and I suppose it is. However, it is bit much for a comfortable, quick second shot out of a responsive twenty gauge. The story is vastly different when turkey hunting, when one shot instantly fills the tag. At the same time, I am a bit puzzled as to why folks like to punish themselves with cumbersome 3-1/2 inch 12 gauges combined with nosebleed or headache-generating 2 or 2-1/4 oz. lead payloads. No need, it just isn't going to make anything deader better. You can use a comparatively comfortable, smooth Federal 1-5/8 oz. three inch #7 Heavyweight load out of your 12 gauge and have a no-nonsense 50 yard plus turkey load without any drama. That's exactly what I did, last year, using an Ithaca Model 37 Turkeyslayer. It doesn't get much easier than that. Back to the 20 gauge potential, though. My Dad is soon to be 83, and he doesn't have much interest in dragging a 12 gauge around. He's been willing to, though, for turkey in times past, as the best pattern wins. Not last year, though, for he dropped his Tom with his older Browning Gold 20 that shoulders perfectly for him. 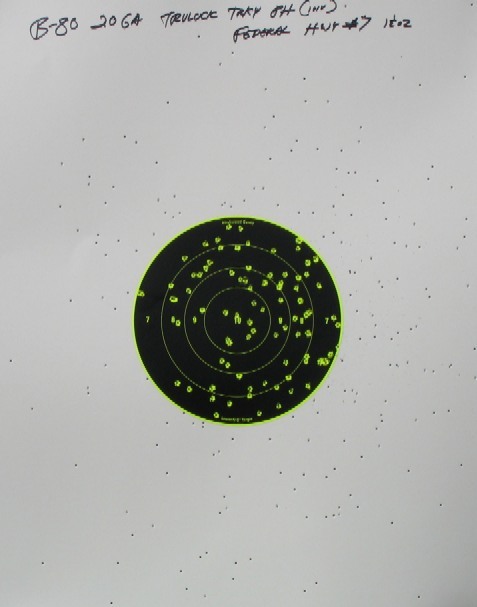 Federal Heavyweight #7 at 40 yards out of a Trulock-enhanced Browning B-80 twenty gauge. At the bench, I sure did do more than my fair share of 20 gauge patterning. Dad is smart enough to avoid it until the last couple of confirmation shots when he can get junior to do all the choke-changing for him. Old age, guile, and treachery triumph yet again. One of the best series of patterns came out of my old B-80, pre-armed with an AL-2 magnum mainspring. Despite the glorious patterns, the Federal loads started to generate some peening in that B-80, something that I've never felt with its usual pheasant load diet of 1-5/16 oz. lead loads. Though I'm not nearly as full of guile as Dad, I do know enough not to ask for broken links from excessive bolt speed in an older gas gun. Sometimes, you might be better off listening to your gun. Other actions don't care. Subsequent testing with a Benelli M2 is a good example. If there was a surprise, though, it was the incredibly low recoil of a pair of Browning A-5 20 Magnums with this Federal shell. Just amazing, despite no recoil pad at all and drilling paper from the bench. With fresh friction pieces and a magazine tube essentially dry, an A-5 Mag is like a dream come true. Yet another A-5 is what the Federal Heavyweight load forced me to buy. You might wonder what the purpose is of an A-5 20 Mag slug gun might be, with a cylinder choked smooth bore? As a slug gun, it wouldn't be my choice for much of anything. Modern 20 gauge saboted rounds, like the Federal Tipped Barnes Expander loads, have largely obsoleted both the smooth bore and the 12 gauge as preferred deer-hunting firearms in slug-only states and zones. As a turkey gun, though, there isn't much better. The Miroku A-5 barrels are rated for steel shot, so having the barrel threaded for Tru-Chokes by Mike Orlen is easy enough. Add the proper Trulock Precision Hunter extended tube, season your pattern to taste, and there you go. The 24 inch barrel is just about ideal for inside the blind, A-5's have always had quick-shouldering stocks with a 14 inch or so length of pull, and with integral iron sights precise point of impact adjustments are effortless. Load One represents an approximation of the 1.5 oz. 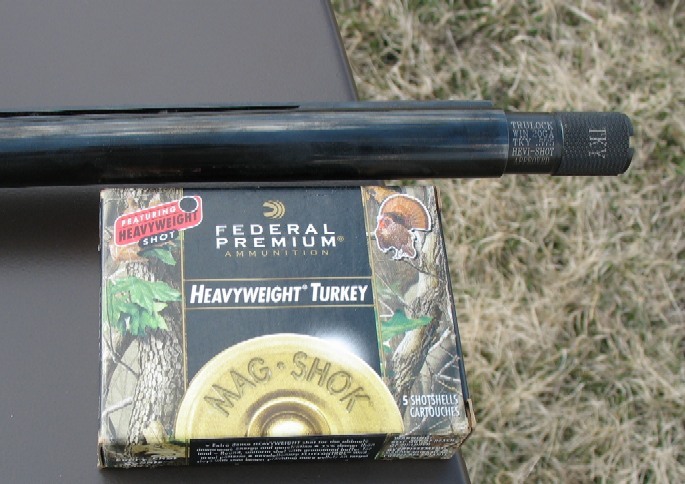 Federal Heavyweight 20 gauge load, Load Two approximates the new Federal 1-1/8 oz. load. Federal's claim of 40% recoil is right on the button, as "Free Recoil" of their new offering is just 60% of the original heavy payload Heavyweight. The better turkey patterns are naturally excessively tight for wingshooting, where the goal is the largest effective spread and the entire trunk of the bird is considered a vital area. The 1-1/2 oz. Federal load has around 337 pellets. The new Federal 1-1/8 oz. load has about 250 pellets, over 17% more pellets than the approximated 213 pellet count of a 1-1/4 oz. #5 buffered lead load. Despite less recoil than an 1-1/4 oz. payload of #5 lead, the Federal Heavyweight shot, due to its industry-leading density of 15 grams per cubic centimeter, offers better penetration at all ranges compared to #5 lead. For 2-3/4 in. twenty gauges, this is a blessing. For twenty gauge wingshooting, it should be a blessing as well. For turkey, the pattern board will tell us the range limit for good coverage. The patterning board will tell us the best choke as well for pheasant and ducks, but in both cases it should prove to be a moderate recoiling, yet extremely effective 40  45 yard load. As most know, once certain states get their fingers on things, lead can be a no-no. That includes state-run pheasant hunting areas where, inexplicably, pheasants are released yet lead is prohibited. Regardless, where the limit is two roosters a day as it is here in Illinois, ammunition is an inconsequential cost of hunting compared to just about everything else. It may sound like quite a mouthful, but it sounds like Federal might just have the best factory duck and pheasant shell ever made for the 20 gauge.